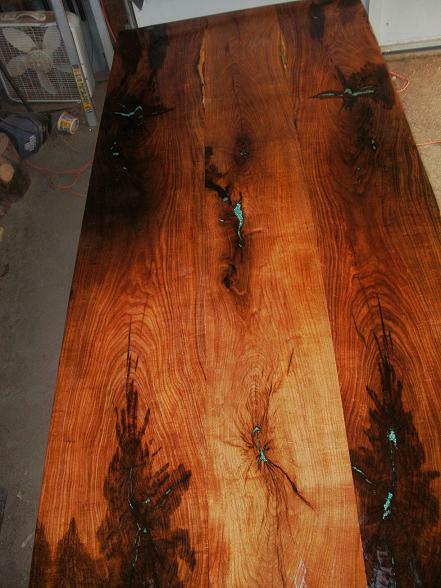 This beautiful mesquite table top was for a customer in Ohio. It was to be placed on a custom metal base. The size of this top was 90 x 40. We were able to come across some beautiful long pieces of mesquite all from the same tree and two of them were book matching. 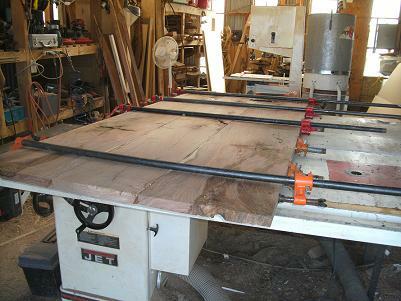 It is very hard to come across mesquite this long and wide enough to only need three boards to make it. Mesquite is a slow growing tree and extremely hard to work with. Therefore, making it a little pricier than some other domestic woods. But the end result is quite worth it. It has a lot of cracks and voids that have to be filled, but adding turquoise or other gems can really make a piece pop. Mesquite makes beautiful furniture. But we also create carved bowls, vessels and wall sculptures from it as well. 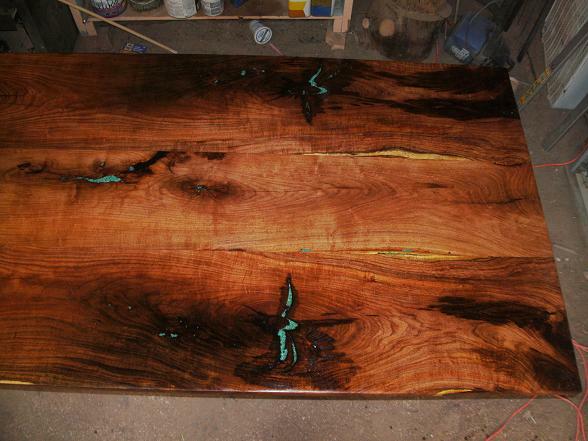 On this table top we inlayed Turquoise into some of the natural cracks and crevices. And we were able to leave a little bit of a bullet in the top to add some southwest charm. This piece had some beautiful grain and turned out great. We were happy to hear from the customer that it arrived in good shape and that they were so happy with it. This ribbon sculpture was a commissioned piece from a Scottsdale customer. She needed a piece at a certain length and width and we designed this wenge with plywood wall sculpture to fit her needs. The middle is made from plywood. Several pieces are glued up to get the layered affect. Then the Wenge or any other wood is placed on the top and bottom. 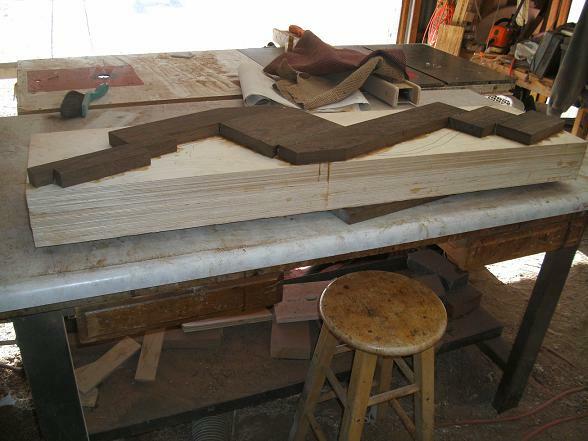 The pattern is drawn and then a large portion of the wood is cutout with the bandsaw. Grinders are then used to do the shaping to resemble a ribbon. The piece lays flat against the wall to hang in any desired direction. This was a fun piece to make, so we therefore created another out of purpleheart and have one in the making out of mesquite. These unique wall sculptures can be made out of any type of wood from a solid piece to combining the plywood or other contrasting woods. They start at $1200.00 and go up depending on the wood. 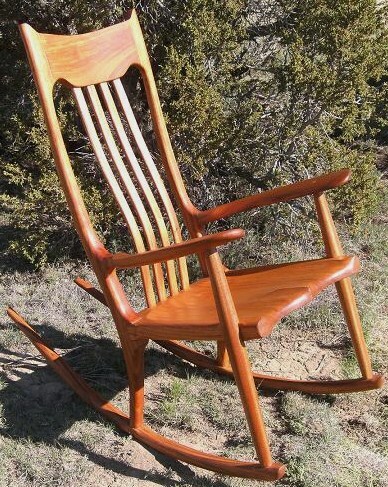 Our newest designed rocker was meant to be vary basic commissioned porch rocker, with a square look. 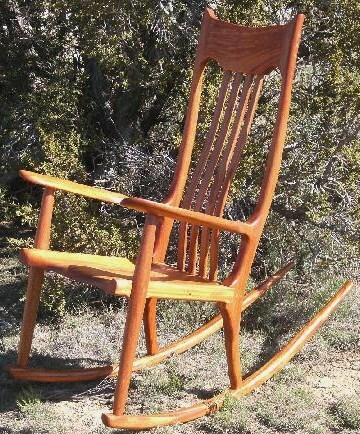 However, we decided we wanted to market this porch style rocker, so we put a little more artistic touches to it. 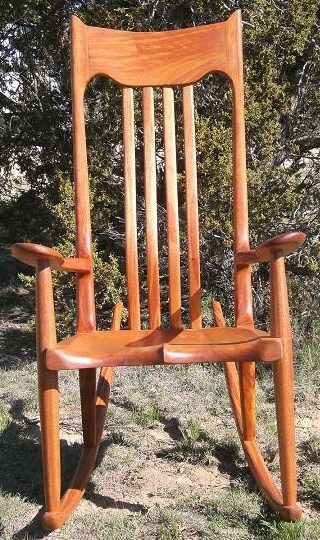 Even though it is not as elaborate as our higher end rockers, it still has some handshaping to it, and a carved seat. The back lumbar support was made from bentwood to form into the lower back. Although we didn’t use the traditional Maloof style joinery, we still used time tested joinery to ensure the strength and longevity of this piece. 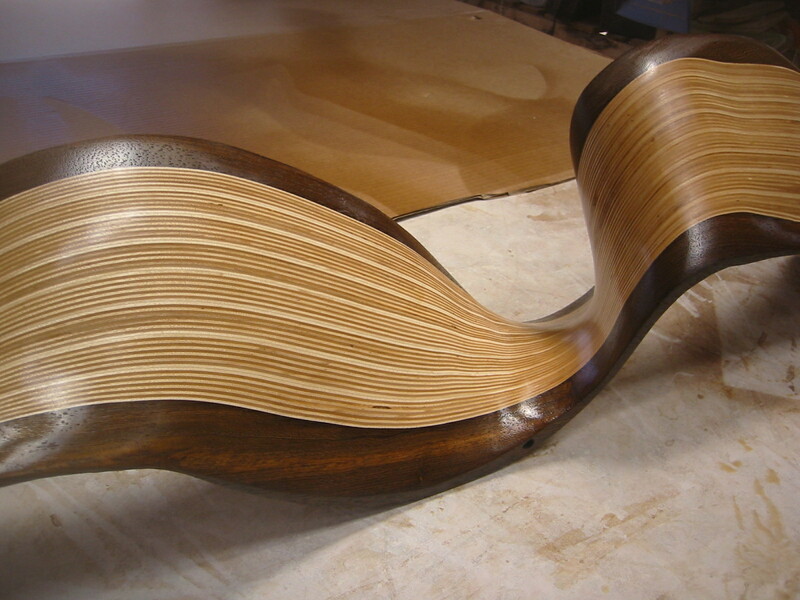 The runners are the same bentwood lamination that we use on our other rockers. We also did a little handshaping on the headrest and the arms. 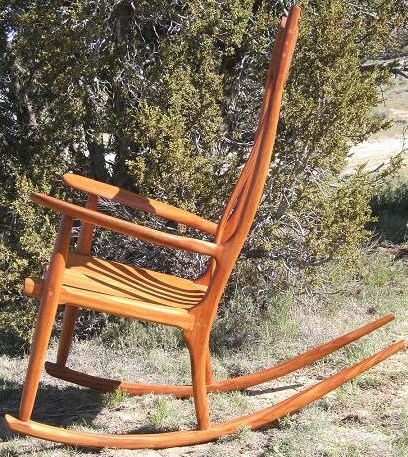 This rocker was made from mahogany with an outdoor finish applied, since it would be going out on a porch. We can make these out of most woods and the prices start at $1900.00. Making them very reasonable but still artistic. These would look great out on a covered porch or inside. Either way, they would be a great addition to any home and a beautiful heirloom piece to pass down. You are currently browsing the Shangrilawoodworks's Blog blog archives for June, 2010.